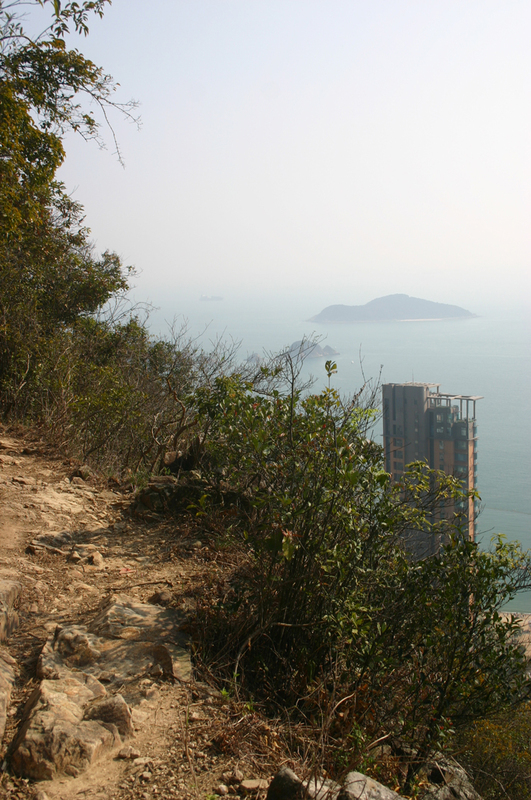 Fine walk across this sharp hill on the south of Hong Kong Island. 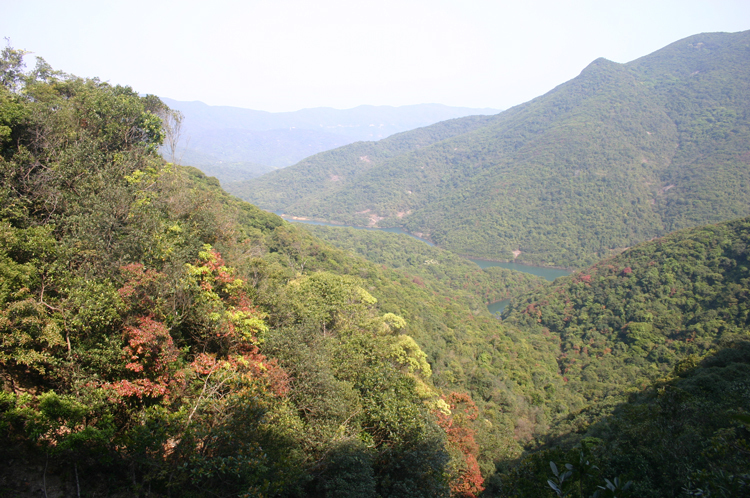 Magnificent views, across placid reservoirs nestled amid rocky, verdant hills, and toward towers clustered around the bays, distant islands shimmering in the haze. 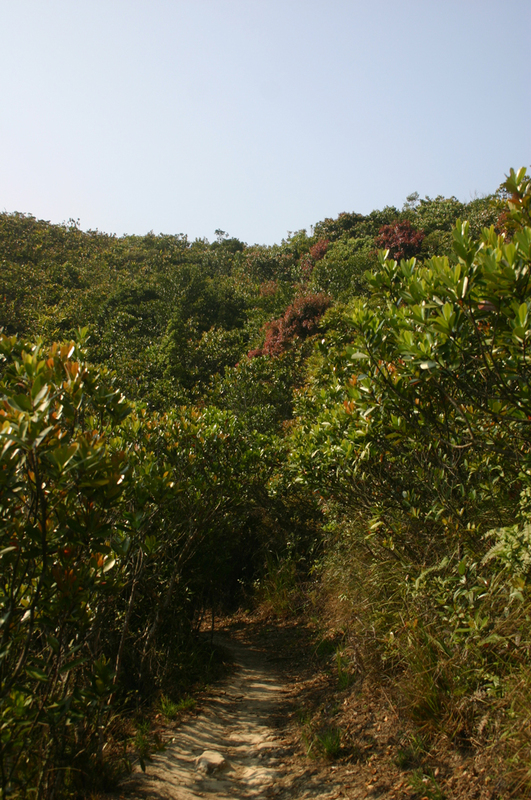 Beautiful shrub azaleas and sub-tropical woodlands; surprising birdsong and wildlife, just across the ridge from one of the world's most densely populated cities. 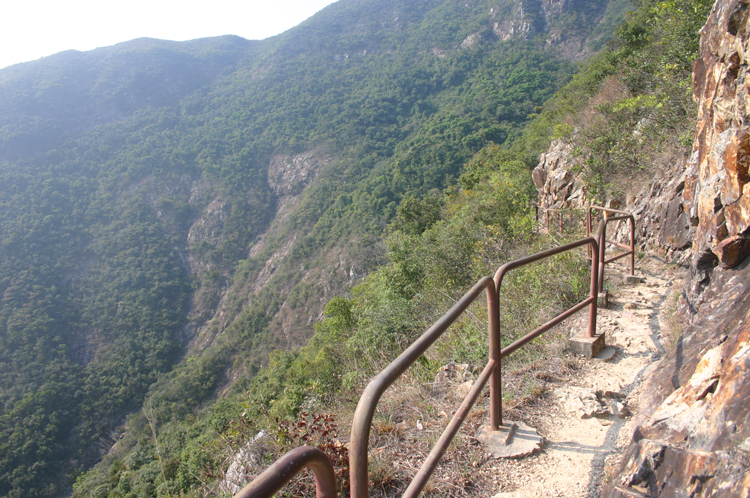 Pity about the concreted paths. Note: Negs: popularity; concreting; pollution. 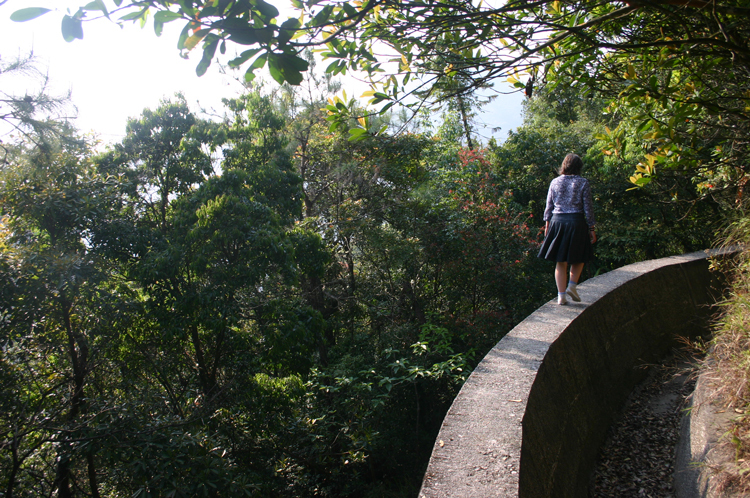 One of our favourite Hong Kong walks, a demanding yomp on the Wilson Trail over this sharp hill on the south of Hong Kong Island, followed by a steady meander beside storm drains back around the contours of the hill. 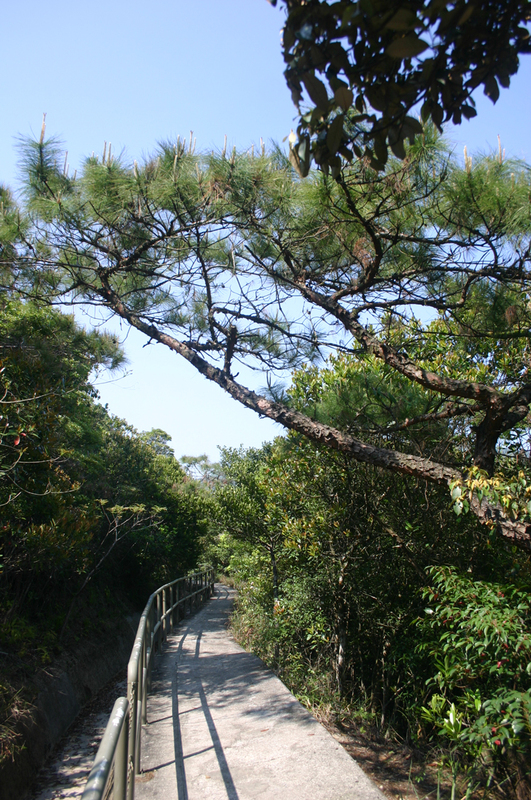 Starting at the hideous, corruption-built Parkview, the trail climbs steeply up a long ridge through shrub azaleas, which sport beautiful flowers over a long season. 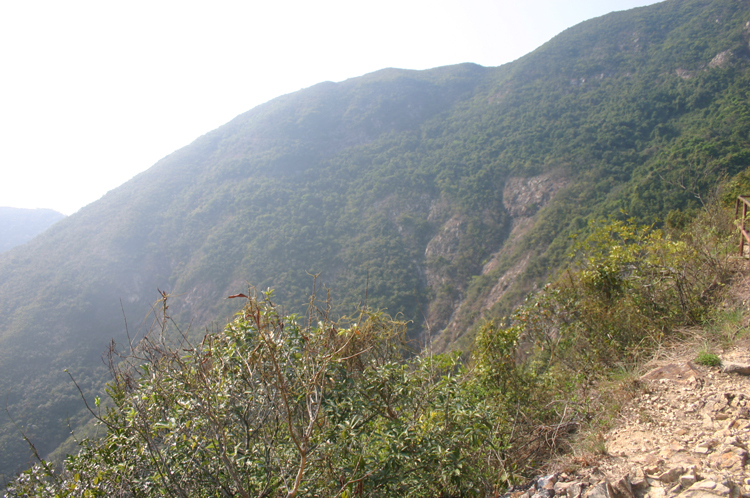 This stage is a bit of a slog on at times concreted paths, but the top of Mt. 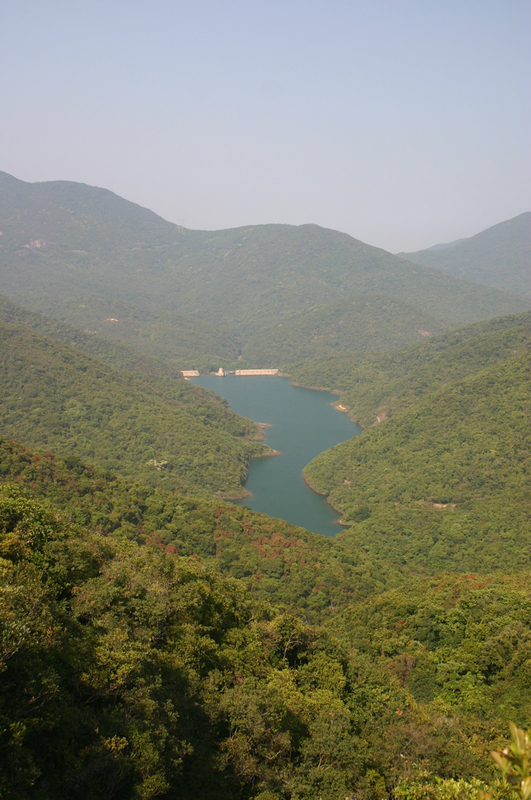 Violet is worth it: wonderful views far down to the upper Tai Tam Reservoir, nestled between steep hillsides of gorgeous mixed foliage, round to the towers lined around Repulse Bay, the outlying islands faintly visible through the haze. 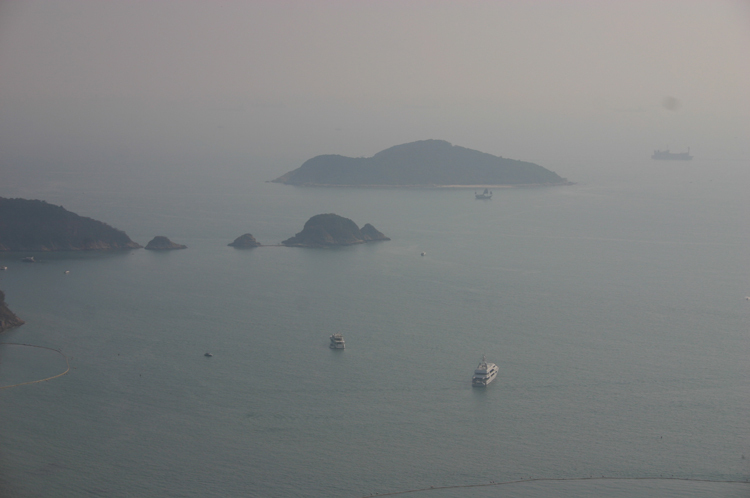 And that most romantic of waters, the South China Sea. 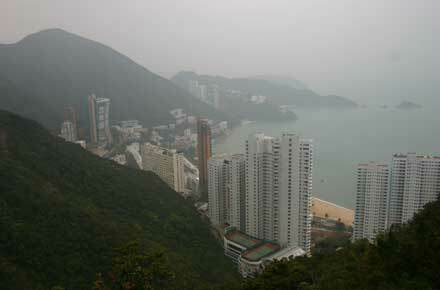 The hike down is fabulous, winding along a ridge which falls sheer to Repulse Bay. You will be surprised by the birdsong and wildlife a wide-spanned kite will circle above you; a large snake slithered across into the scrub when we were last there. 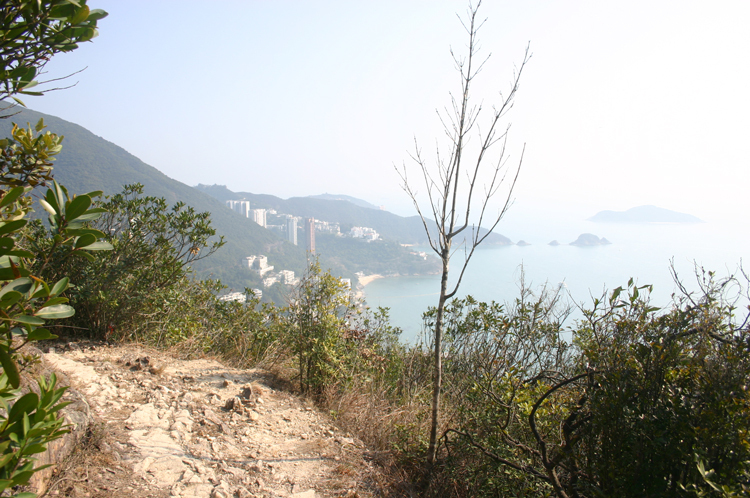 From a junction near some WW2 blockhouses, one way back meanders along a fault in steep cliffs above the densely populated Repulse Bay, then contours beside a storm drain around the rugged, densely forested hillside. 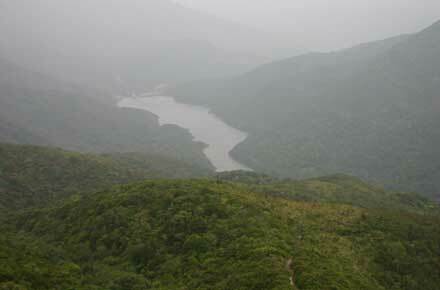 The other follows another water channel high above the peaceful reservoir. This is beautiful, steep, empty hillside and an elevating walk, slightly let down by finishing with a steep, crowded climb back to Parkview. See below. 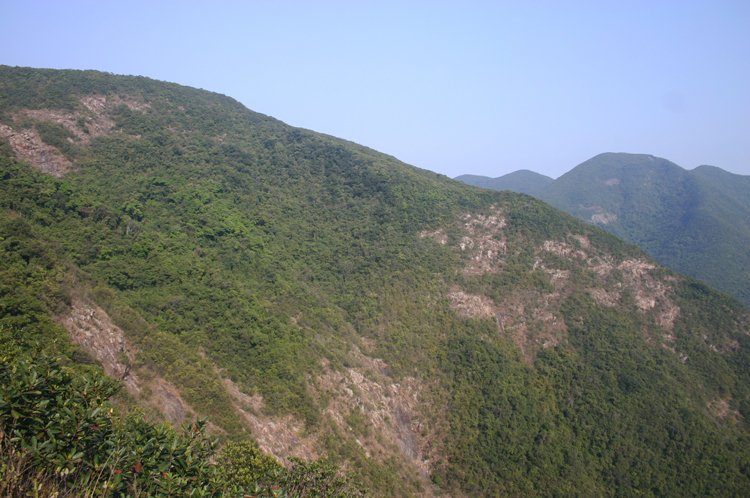 Any enterprising visitor can walk Violet Hill (just 15 minutes from central Hong Kong), which is a testament to the truth behind the cliché: nowhere else in the world can such superb walking exist so close to such dense population. Pity about the concreting on the paths (although we acknowledge the need in places): even when you see no buildings, you sense you are in suburbia. 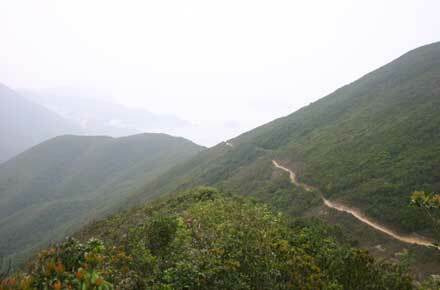 One of Hong Kongs most exciting and delightful walks is the 2 hr+ circuit of Mt. Violet, weaving beside fine and some of Hong Kongs oldest storm drains. 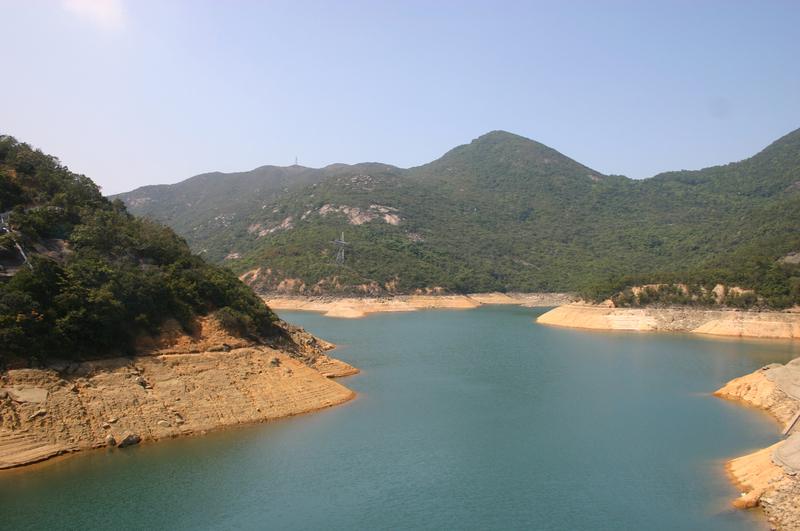 Upper Tai Tam Reservoir was Hong Kongs first major attempt at addressing the difficult water supply problems of this burgeoning colony, with a large dam of finely fitted granite blocks and a tunnel to carry the water through the mountains to the great harbour to the north. 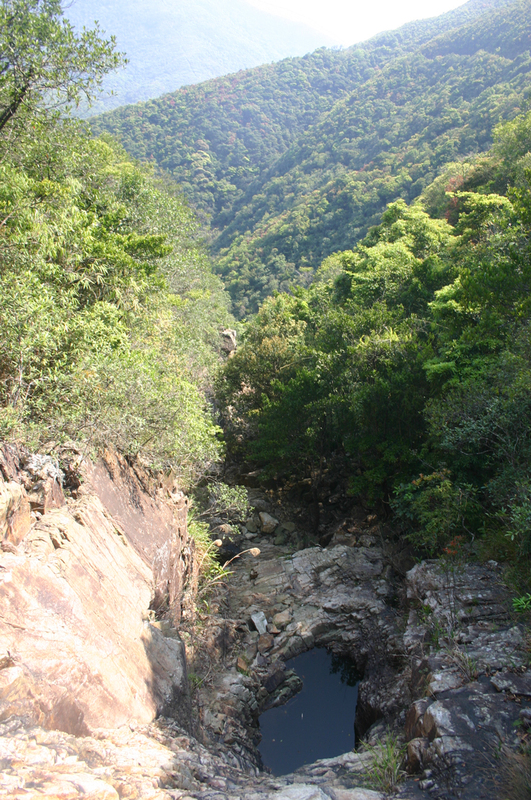 Storm drains catchment channels that feed the reservoirs snake around Hong Kongs mountains, often providing easy walking through impassable hillsides, commanding glorious views. 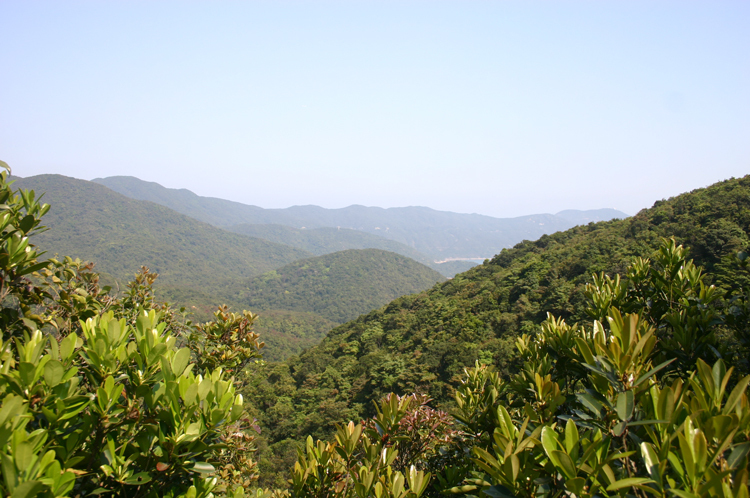 The west catchment from the Tai Tam is a fine example. Start at the County Park entrance at the depressing Parkview development. 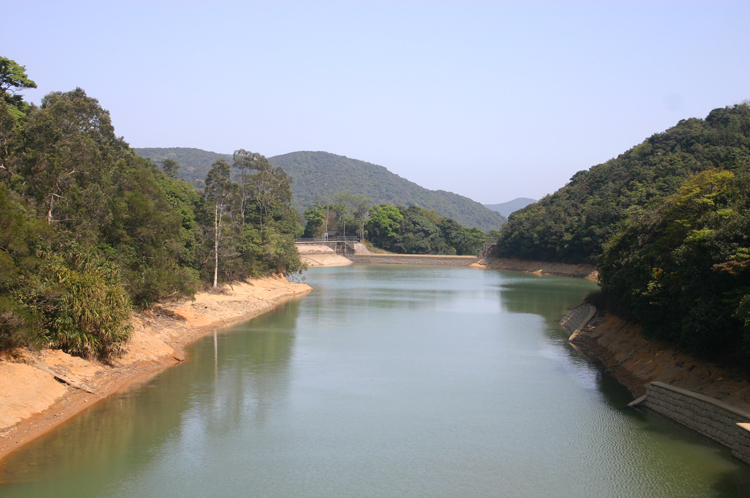 A heavily walked road drops steeply to the reservoir, surrounded by the usually vibrantly green hills of Hong Kongs central spire. 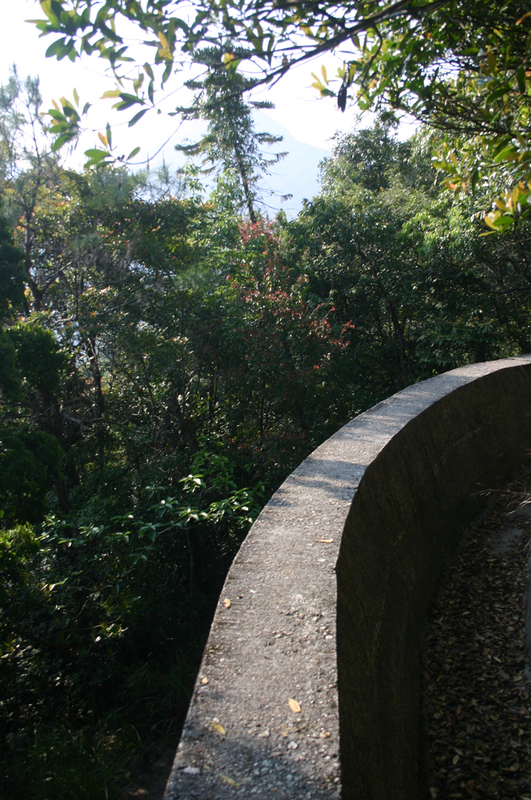 Here is where the fireworks begin: turn right on a stone aqueduct across an arm of the reservoir look out for the endearing terrapins floating in the warm backwaters and you are on the concrete path along the storm drains rim. Apart from the recent, depressing rails to stop walkers falling into the watercourse, this is marvellous walking through the azalea-dominated mixed-shrub forest of Mt. Violets flank. 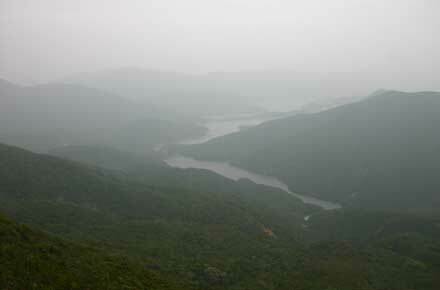 Lovely views open up to the left of a lower reservoir and a corner of Tai Tam Bay between verdant hillsides. 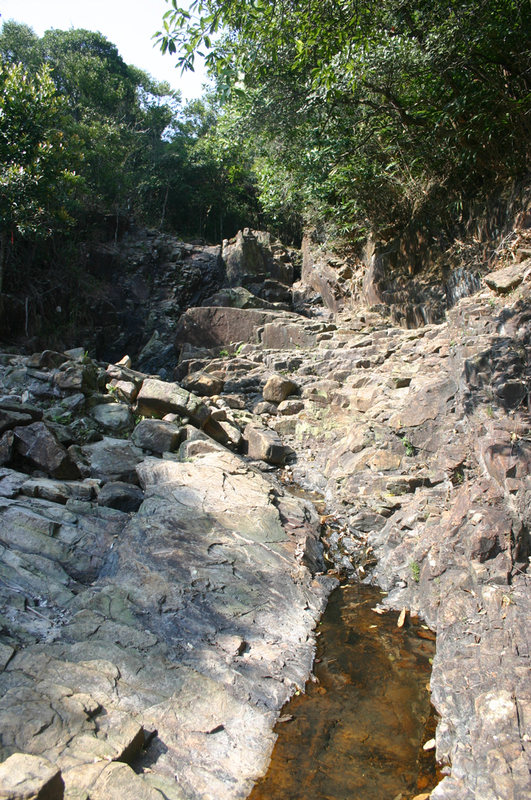 Sit on the rocks by a tiny, gurgling stream perhaps half an hour in (a favourite picnic spot when we lived in Hong Kong), a couple of cliffs-waterfalls in the wet season, and a WW2 blockhouse (now hard to see) on the ridge top overlooking Repulse Bay (now nearly invisible through the growing shrubs), a remnant of a tragic episode. By the time you meet the path coming down off Mt. 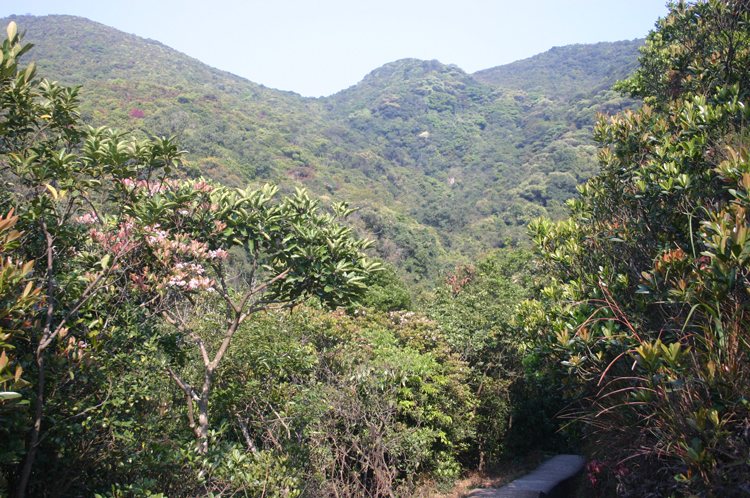 Violet (see above), at the pass to the South Side, the watercourse has petered out and you are on a well-walked trail that becomes dramatic as it continues along a fault in the cliffs behind Repulse Bay, high above that truly Hong Kong mixture of beautiful, island-scattered bay and 30+ storey apartment blocks. Soon after turning back towards the north, you join another nascent storm drain and return to the little reservoirs below Parkview through thick, mixed forest with occasional glimpses of sea, mountains and, yes, the odd tower block. 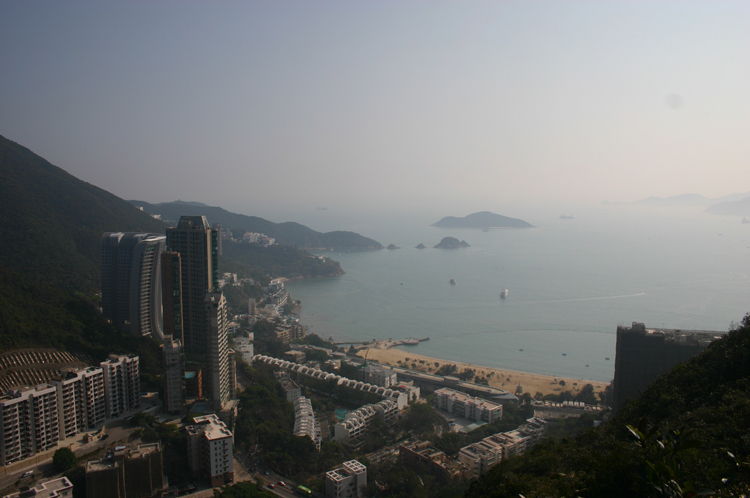 Very Hong Kong.